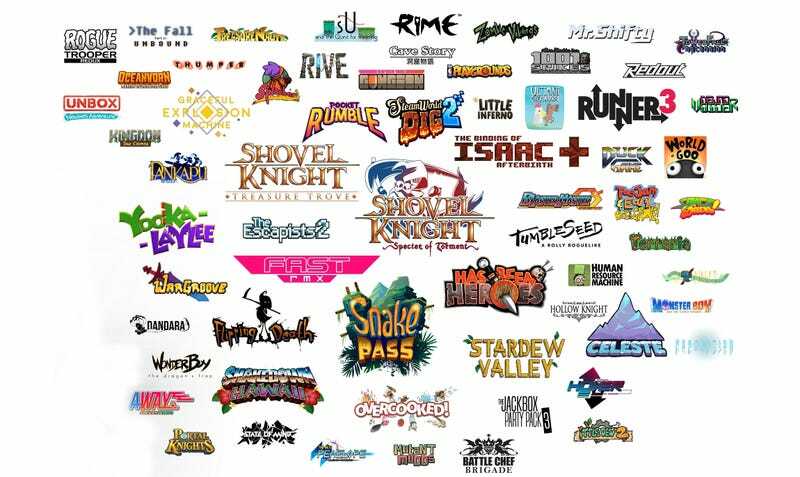 Nintendo says more than 60 indie games will be out for their new console by year’s end. Today, they blasted out a list of 17 of them and showed a lot more logos. Some were already announced. Regardless, some cool stuff here. Like what you see? SteamWorld Dig 2 from Image & Form Games: In the sequel to the award-winning original, you must dig deep, gain riches and explore an underworld riddled with danger. The game is scheduled to launch this summer. It wasn’t that many years ago that Nintendo seemed to have little time for indie game developers, but on the Wii and then even moreso on 3DS and Wii U, the company has started working with more indie developers. Nintendo has made a point of using the annual Game Developers Conference, which is running this week in San Francisco, to highlight the indie games coming to its hardware. The Switch, which launches on March 3, has 32GB of on-board storage. That’ll fill up quickly, even with relatively small indie titles. Games can also be downloaded to SD cards, which are sold separately. Add these indies to the list of big-publisher Switch releases, which you can find right here.